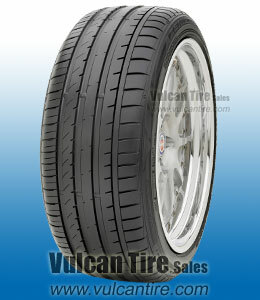 Introducing the FK-453, Falken Tire's Flagship Ultra-High Performance tire. FK453 features the latest developments in noise-absorption technology, and incorporates a high silica compound that presents better dry and wet grip. The multiple nylon-reinforced layers allow for better high-speed stability, an important asset based on the driver�s exacting demands. Designed and tested to meet the demands of European roads, the new high polymer based compound provides superior traction and grip for those seeking ultra high performance needs. Effectively evacuate water and significantly improve hydroplaning resistance for outstanding wet handling. Features large outside shoulder blocks that provide enhanced cornering and better braking traction while reducing tire noise. there great tires. I've bought the same tires for other cars & trucks that I've Owen.